This year our ASG decided to exchange homemade potholders at our Christmas party. I made two, one for the afternoon meeting and one for the evening. In October, someone had handed out directions to make simple potholders that didn’t require binding, so I gave them a try. For the fronts, I scanned a Christmas postcard from my grandmother’s album. It’s in Swedish and dates from the early twenties. 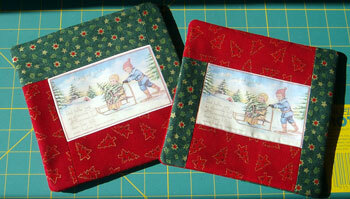 I printed the graphic on photo fabric, then log cabined some scraps to get up to the desired size. The back is made from folded squares of fabric — they are actually sewn on top of the front, then wrapped around to the back to hide the seam allowances. You can arrange the squares in either a four patch or triangles, so I tried both. 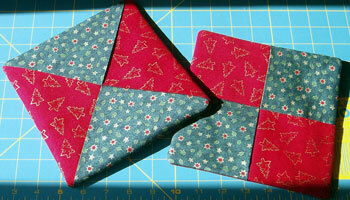 The squares were much easier to handle — the triangles look cool, but you have to wrangle a lot of bias edges. Both were made by people braver than I — the edges are bound! 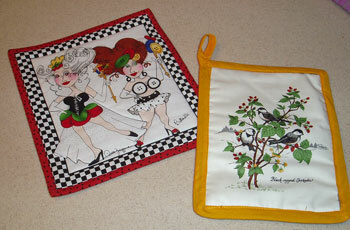 You are currently browsing the J.Sews blog archives for December, 2007.